Amsterdam was again the host for Flame 2018. This year’s conference attracted a large crowd from all over Europe. The Okura Hotel was nicely buzzing with people in the conference rooms and the corridors. The three days programme was full of interesting presentations and discussion panels, all centered around the issues the European gas market is facing. 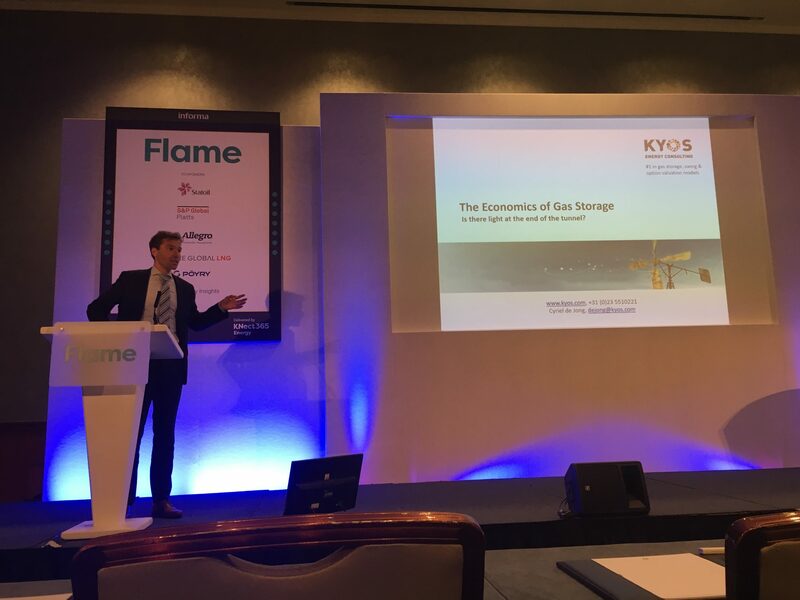 Cyriel de Jong from KYOS was one of the speakers, and in his Flame 2018 presentation he discussed his views on “the economics of storage”. Owners of gas storages are not to be envied at the moment. Due to overcapacity in the market it is difficult to run a profitable business. Gas storage optimization is at the core of KYOS’s business, and therefore a subject close to Cyriel de Jong’s heart. His answer to the question “Is there light at the end of the tunnel?”, would be “Probably”. Albeit not easy, it is still possible to make money with a gas storage, even in these poor market conditions. “To achieve this however, an active trading strategy is essential. And you will need a good modelling system that gives you solid advice and hedging recommendations”. To read his slides, please click here: Flame 2018 Presentation. Would you also like to make your gas storage facility more profitable? Our gas storage modelling software makes this possible. The KYOS models KyStore and KySwing provided the basis for the presentation. The KyStore model supports traders and portfolio managers in natural gas markets. The gas storage optimization software raises revenues from gas storage trading operations, provides accurate valuations and reduces risk with adequate hedge recommendations. The model uses advanced stochastics including Least Squares Monte Carlo techniques to capture the full optionality in gas storage facilities..
KyStore is complemented by KySwing. The KySwing model helps to generate most income from gas contracts by optimizing the contract flexibility. The risk on future income is reduced by forward hedging. The model applies advanced stochastics to find the optimal exercise. Swing options are typical components of gas contracts, which offer the opportunity to vary the contracted volume under a number of restrictions. They are also known as Take-or-Pay (ToP), interruptible and variable load contracts.